Lane End Farm is a small, family run site situated in a rural location on the outskirts of the village of Middleton-on-Sea in West Sussex. 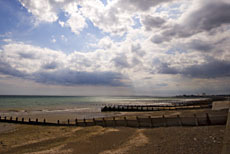 The village and peaceful, family-friendly beach are a short walk away and there are many other attractions within easy reach by car or public transport. Occupancy is restricted to owners and their families which fosters a friendly convivial atmosphere in which to relax and escape from the stresses of modern living. Member of the "British Holiday & Home Parks Association"